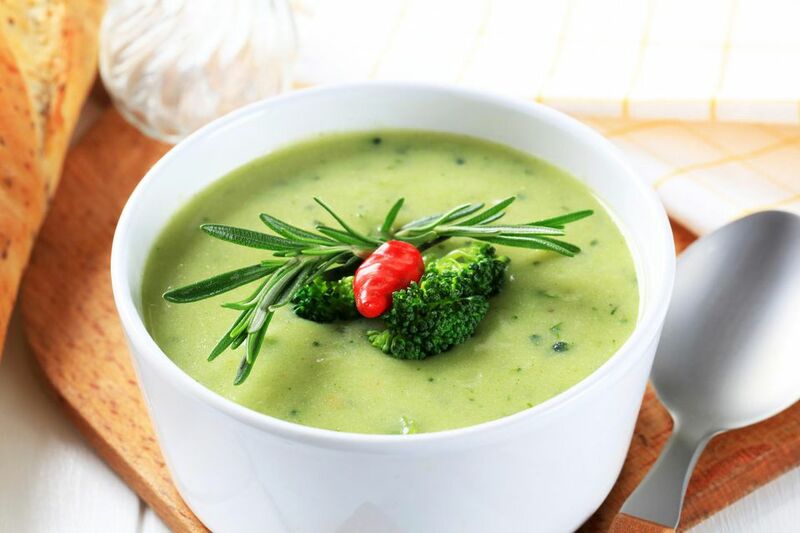 Nutritious and satisfying, this cream of broccoli soup recipe makes for a quick and easy meal. Its velvety smooth texture, along with a subtly fresh, creamy flavor, will make this pureed soup a favorite with broccoli lovers. A handful of homemade bacon thyme croutons make it extra hearty. In a large saucepan set over medium heat, sauté the chopped onion in butter just until it turns translucent and tender. Add the chicken stock and broccoli and bring the mixture to a boil. Reduce the heat to low, and simmer the soup for 8 to 10 minutes, until the broccoli is tender. Using a blender, puree the broccoli soup until it is smooth. Carefully transfer the hot broccoli mixture back into the saucepan and stir in the heavy cream, salt, pepper, and nutmeg. Heat the soup though - avoid boiling it - and serve immediately. This cream of broccoli soup recipe makes 4 to 6 servings. Did You Know Lobster Bisque Could Taste This Good?